BOSTON - The Boston University women's ice hockey team battled No. 9 Northeastern to a 3-3 tie on Saturday afternoon at Walter Brown Arena. Sophomore Jesse Compher, redshirt junior Sammy Davis and sophomore Nara Elia all lit the lamp for the Terriers (0-1-1, 0-1-1 WHEA). Sophomore Corinne Schroeder made 35 saves and stopped all eight Northeastern (1-0-1, 1-0-1 WHEA) shots she faced in the third period and overtime. - The Terriers got off to a dream start when Compher scored the team's first goal of the season just 2:40 into the proceedings. Compher gained entry into the Northeastern zone before dropping the puck back for freshman Courtney Correia. The rookie fired a shot on goal that Brittany Bugalski (34 saves) turned aside, but Compher was there to knock home the rebound. 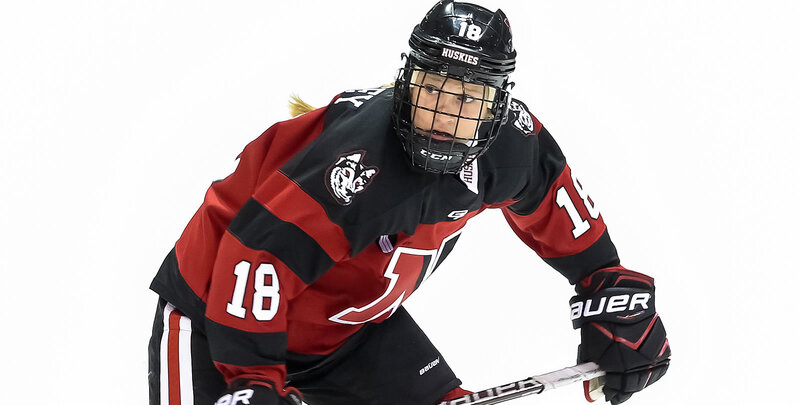 - Northeastern responded with a power-play marker 2:08 after Compher's strike, but Davis answered right back with her first goal of the year to regain the lead. Compher and freshman Alex Allan each assisted on Davis' tally. - Elia extended the lead to 3-1 with 1:08 remaining in the first frame. Davis rushed up the left wing and fired a pass to the front of the net. The puck caromed off a Husky skate and right to Elia, who fired home her first goal of the season. Junior Abby Cook began the rush and earned her first assist of the season. - The Huskies tallied two goals in the second stanza, including a power-play strike, to even the score at 3-3 entering the final 20 minutes. - BU outshot Northeastern, 18-6, in the third period but was unable to get a go-ahead goal. - The Terriers' sustained pressure in the Northeastern offensive zone led to a pair of power-play chances, but the Huskies killed off both chances to keep the game tied after 60 minutes. - BU earned its sixth power-play opportunity of the contest with 1:16 to play in overtime, but the Terriers were unable to capitalize on it. - Davis' goal was her first since Jan. 14, 2017, when she scored in a 3-3 tie with Vermont. - The redshirt junior missed all of last season due to injury. - Compher joined Davis as Terriers with a goal and an assist on Saturday. - Correia and Allan both earned their first collegiate points with their first-period helpers. - BU outshot Northeastern in both the first period and the third period, finishing the afternoon with 37 in total. - Schroeder made 16 of her 35 saves in the second stanza. - The Terriers will hit the road for the first time this season when they travel to Merrimack on Friday, Oct. 12.